Since celebrating International Women’s Day last year, we have grown our #WomenInSpine series with numerous features of our female leaders at NuVasive. This year, we are proud to keep empowering women with the launch of our first Employee Resource Group (ERG): Women in Spine (WIS). This new group is committed to building an inclusive culture to ensure that NuVasive realizes the full potential of its female talent. With our ERG and #WomenInSpine blog series, NUVA aims to continue to celebrate and highlight our female shareowners’ achievements and success. 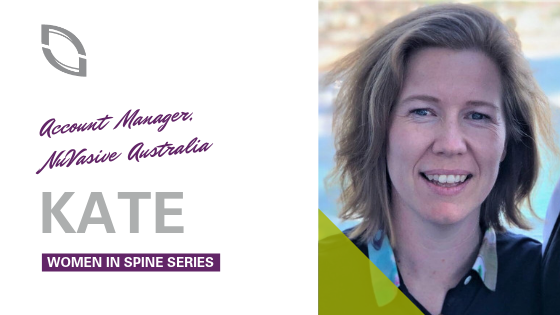 Featuring our next #WomenInSpine feature, Kate, Account Manager located in NuVasive Australia. The New Zealand Prime Minister, Jacinda Ardern. She became Prime Minister in 2017 at the age of 37. She is the world’s youngest female head of government and New Zealand’s third female Prime Minister. While in office, Jacinda gave birth to her first child. After a very short six weeks of parental leave, Jacinda returned to the country’s top job while her partner became a stay-at-home father. Jacinda has disrupted the status quo of what is expected in a country’s leader. Jacinda is both a smart operator and a great negotiator while still being a strong, compassionate, and empathetic leader. What advice would you give to other female professionals in Marketing? The same advice that I give to everyone in sales—success will come if you are able to bring your full authentic self to your work. This generates trust between you, your customers, and your teammates. Put your customer and their patients first and you will create long lasting partnerships. Be generous with your time for others, work equally as hard for your teammates, and you will create long term success for everyone. You can’t be what you can’t see! While there is a gender imbalance at senior leadership levels, there will always be a level of unconscious bias. The data shows that males dominate leadership roles in governments, boards, and executive leadership teams. This perpetuates the imbalance as like-for-like leaders are often chosen as successors because similar leadership traits are more easily identified. Let’s continue to look for progressive leaders, as this will lead to a more inclusive and diverse environment. To work in the fast-paced, ever-changing world of spine you have to be able to keep up! There is fascinating research around the differences between male and female brains which tells us that our brains are inherently wired differently. This means there are differences in how males and females approach tasks, handle stress, use language, deal with emotions, and so on. With these well-known differences in our brains, it is imperative that we take advantage of the broadest range of diverse brain power available! The challenge ahead is not just a challenge for women, but a challenge for men too. There is still work to be done to see the benefits of diversity and progressive thinking within businesses, right up to executive levels. At the moment, it seems that both men and women are missing out when it comes to work and family life. Even in our modern society, having a spouse take care of the kids and things on the domestic front has been an advantage enjoyed vastly more by men than women. For gender equality at work to be achieved and for us to shake these unconscious biases that exist, we can’t just look at the barriers women face in the workplace. The question also must be asked—how do we create more flexibility for men? To read other #WomenInSpine features, click here to browse our ‘Culture’ section.